Thoroughly modern Tel Aviv is at heart a pioneer city, progressive on many fronts, socially and culturally vital, with cutting-edge arts and food; a mecca for start-ups of all kinds and ranked #2 in the world for high-tech innovation in 2013. Go to Tel Aviv for the beaches, the food, the modern architecture, the museums and galleries, but while there, don’t miss ancient Jaffa (Yafo), the seed of this shimmery metropolis. Built on an elevated, blunt headland, Jaffa’s long views and natural harbor offered security and industry at least back to the Bronze Age. It’s one of the world’s oldest ports. A short list of landlords includes Canaanites, Egyptians, Philistines, Israelites, Assyrians, Greeks, Romans, Arabs, Crusaders, and Ottomans. Christians know Jaffa as the site of Peter’s vision on the roof of Simon the Tanner’s house which compelled him to preach to Gentiles, as well as Jews (Acts 10:5-23). It was also in Jaffa that Peter raised Tabitha from the dead (Acts 9:36-42). These events are commemorated in Jaffa at Simon the Tanner’s House, the Russian Orthodox Church of Tabitha and the Church of St. Peter. Jaffa is also the place from which Jonah set out on his fishy adventure told in the Biblical Book of Jonah and in the Koran. Visit Jaffa for its history but also for galleries, shops, restaurants and bars. The flea market, just east of the clock tower at the entrance of Old Jaffa is jammed with everything from trendy clothes to antiques to unapologetic junk. Spend a few daytime hours taking in the romantic, old-world ambience. Follow the narrow, cobbled streets which weave up and around, from the port to the top of the hill, opening periodically onto intimate little squares. At Jaffa’s main plaza, Kikar Kedumim, you’ll find St. Peter’s Church and the visitor’s center/museum, which is built around Roman-era excavations and also exhibits artifacts from other digs in the area. Above Kedumim Square is Summit Park, the highest point in Tel Aviv-Jaffa, with great views of Tel Aviv and the sea. Within the park, Ra’amses Gate Garden encompasses remains of an Egyptian fortress. Jaffa is at the southern end of Tel Aviv, easily reached on foot or bike along the waterfront promenade. 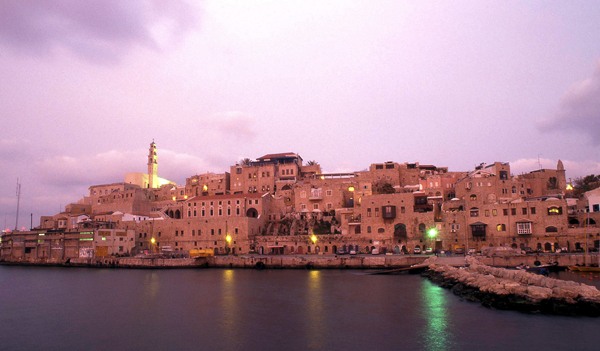 If you’re in Tel Aviv to party, don’t miss Jaffa after dark. This entry was posted in Israel and tagged jaffa, Tel Aviv by yalla2013. Bookmark the permalink. I’ve been there in the 70ies and 80ies. Probably changed a lot. It really has changed a lot in the last 10 years, very trendy these days.